Harnesses give smaller dogs a sense of security as they walk, skitter, and prance along city sidewalks and through leafy parks. 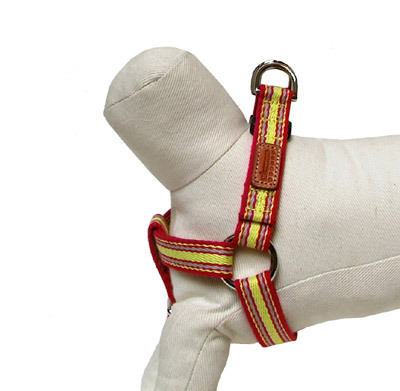 Sturdy cotton webbing harness with woven red, yellow and grey stripes. Snaps closed with a lightweight durable plastic fastener. Leather GEORGE logo patch. 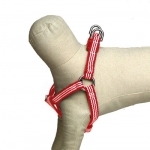 Small (1/2″ cotton webbing) suits dogs measuring between 12″ and 17″ in girth (approximately 8 to 12 lbs.). Large (3/4″ cotton webbing) is most fitting for those measuring between 17″ and 23″ (approximately 13 to 20 lbs.). To choose the correct harness size, click here.